I dried the laundry on the line outside just because I could. Did some in the dryer, some on the line ... perfect! Oh, and we bought a car. Well. My father bought a car - for us. This is it. Picture us, sitting in these seats, bickering all the way to Black Creek Pioneer Village and back (I got a free pass from the library today). 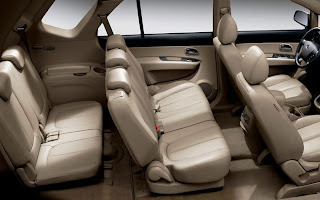 I am just amazed that a CAR has seven seats. Sure, at that size, it holds seven people plus a BOX OF TOOTHPICKS. But it's a car. What they used to call a station wagon, before they made the stickly rule that every single person needs a seatbelt. I feel so lazy; I'm blogging and Ted's downstairs cleaning out the mouse potato room. My next post may explain why I get to be so self-indulgent.